27 « February « 2013 « Nothing in Biology Makes Sense! Competition for mates drives the evolution of many of the exaggerated male traits, such as the bright plumage of tropical birds or the intricate horns of dung beetles, that are so easily appreciated (and photographed). However, the elaborate consequences of competition for mates continue even after mate choice and copulation has taken place, inside of the female reproductive tract. Much of the research on sperm competition has focused, for obvious reasons, on the quantity and morphology of the sperm produced by males with results that are no less fascinating or extreme. For example, the fruit fly, Drosophila bifurca, produce sperm that are around 2.3 inches long, which is more than 20 times their body length and 1000 times the length of human sperm! However, sperm constitute only a small portion of the male ejaculate transferred to females during mating. The rest, up to 90%, is composed of a myriad of proteins and other compounds that constitute the seminal fluid. In addition to being produced in abundance, seminal fluid proteins are also diverse. For example, scientists have found that males, of many species, produce dozens, if not hundreds, of different types of seminal fluid proteins. So, what then, do all these proteins do? It turns out that these protein are involved in many different processes that indirectly influence male reproductive success, including influencing female physiology and interacting with a male’s own, as well as rival, sperm. 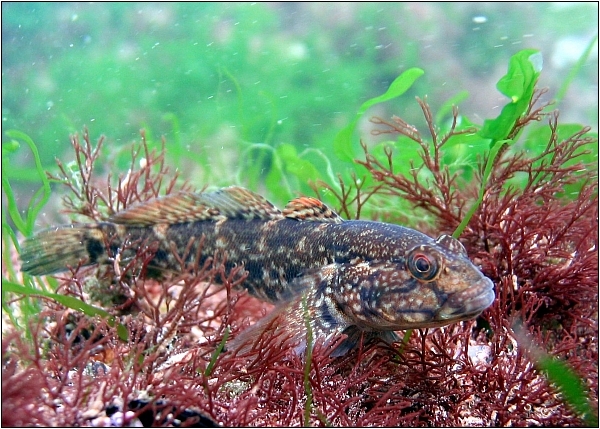 A recent study by Locatello et al., published in Proceedings of the Royal Society B, has taken advantage of some useful characteristics of the mating system of the grass goby, Zosterisessor ophiocephalus, (pictured above) to investigate how alternative male mating strategies may be paired with alternative sperm competition strategies to help level the playing field between males that vary in their ability to directly compete for mates.